For two decades, Mandy's canvasses have been displayed on countless buildings and theatres, creating public landmarks. Each project is unique to it’s own environment and has a relationship with the community and space it is created for. 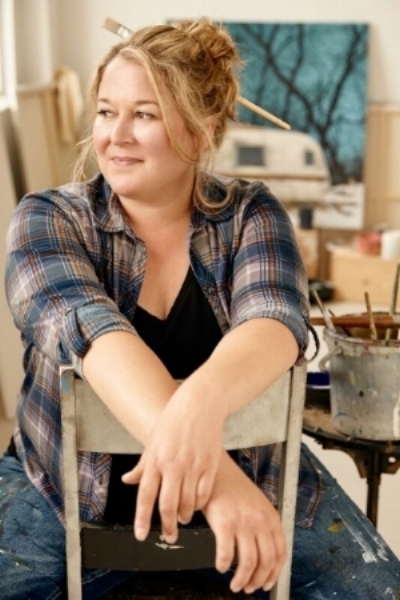 As a Canadian contemporary realist painter of urban murals, Mandy's artistic process began as a child during frequent excursions to the prairie city of Winnipeg, Manitoba, and her desire to 'beautify' the often neglected areas of the city core. Over the years, her work has generated much attention in turning bleak 'brick and mortar' walls into unforgettable landmarks that recognize historical events or special tributes to community heroes and personalities throughout the province. Although some of her art is characterized by different styles and techniques using vibrant colours, contrasting shapes, and bold compositions for outdoor murals, theatrical backdrops, zoo enclosures, commercial establishments or 'Man Caves,' she also has the ability to soften the design more appropriate for a child's nursery, a themed children's room or a distinctive and soothing wall mural in a private home. In addition to large scale murals, Mandy also creates original art on canvas. Her work appears in the private collections of many home and business owners. Mandy has a highly developed sense of colour and composition, and a keen attention to detail. She illuminates qualities that often go unnoticed by the casual observer.